Or view larger version. Rally in front of the Alameda County Court House. July 14, 1968. Lonnie Wilson, photographer. Gelatin silver print. Collection of the Oakland Museum of California. The Oakland Tribune Collection. Gift of ANG Newspapers. 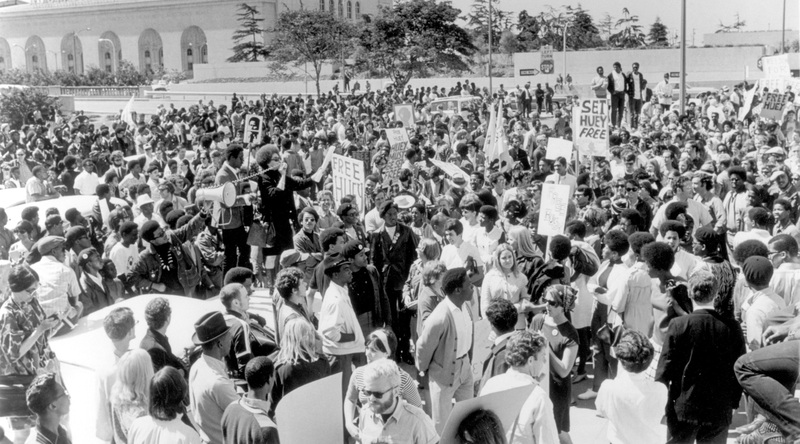 This photograph shows a rally for Huey Newton that took place in front of the Alameda County Court House in Oakland, California on July 14, 1968. Newton was on trial for the murder of Oakland police officer, John Frey. Newton was convicted of voluntary manslaughter, but the California Appellate Court reversed the conviction and after two subsequent mistrials, the State of California dropped the case.